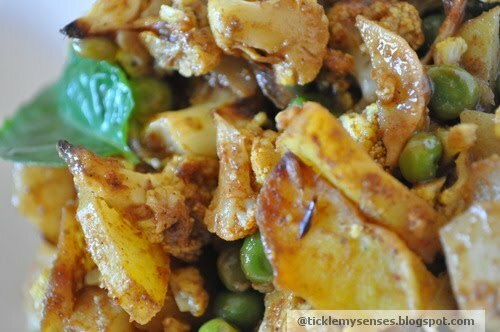 Tickle My Senses: Baked Aloo Gobi Mutter / Baked Spicy Potato, Cauliflower and Peas. Baked Aloo Gobi Mutter / Baked Spicy Potato, Cauliflower and Peas. Well since baby was born , I rarely get the time to cook elaborate meals, hence thinking cap on, I decided to bake the potato and cauliflower in an oven with some salt and chilli/ cayenne pepper powder (and while it was baking I was free to play with little bubba) .... once baked I then flash fried the cooked potato and cauliflower in some oil and final dressing of spices.. I tell you it was fuss free and yummy. Do try it....give it a go and let me know what you think of my baked version. To make sure the cauliflower and potato cooked in same amount of time I chose baby potatoes as they cook quicker and made them into 1/2 inch cubes and tore each large cauliflower floret into smaller slender florets. Preheat oven to 200 degrees centigrade or 400F. 1. Place chopped florets and potatoes on a baking sheet, pour over 3 tbsps oil, sprinkle over salt, 2 tsps chilli/cayenne pepper powder and mix well with fingers. 2. Bake in center of oven for 10 mins. Then turn over and bake for another 5 minutes. Check whether done . The potato should be well done and I prefer the cauliflower to still have a little bit of crunch. Take the baking tray out of the oven and keep aside. 2. In a small bowl take all the remaining dry spice ingredients, add 1/3 cup water, mix well, to make a runny paste. 3. Heat oil in a wok, add hing, cumin seeds (let it splutter) , add the ginger garlic paste, fry for 2-3 mins, add masala paste, fry for 2 mins, add peas(optional. I use frozen peas) and fry for 2 more minutes. 4. Add the baked potatoes and cauliflower, toss well till evenly coated, (sprinkle more water over vegetable if it appears too dry). Cook for 3-4 minutes. Garnish with chopped coriander leaves and serve warm with rice pulao. Enjoy!